wst... has learned that louisiana college president dr. joe aguillard had a heart attack this morning. sources tell wst... that he may have to undergo surgery later but that doctors did put a stent in. 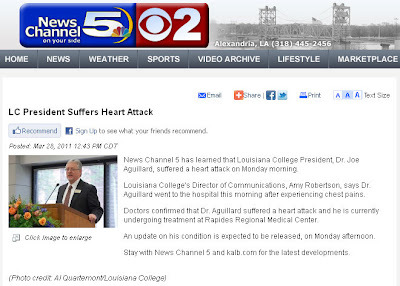 This is to let our LC Community know that early this morning Dr. Aguillard was taken to the hospital after suffering an apparent heart attack. Doctors are running tests to determine the best course of treatment for him. As of yet, there is no official word from his cardiologist.